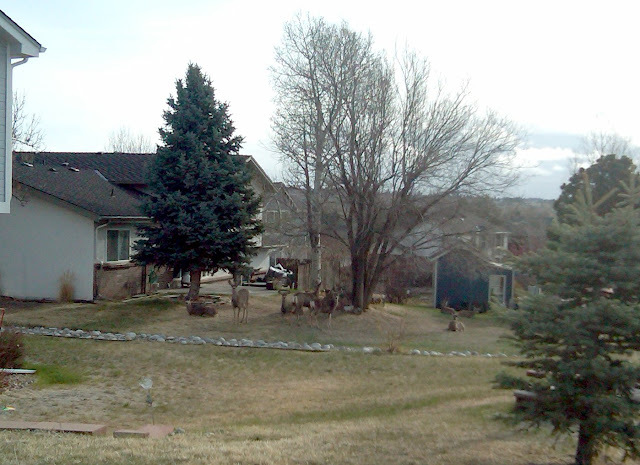 Boogie the Giant Schnauzer and I saw this herd of deer on our morning walkies. Naturally, they were suspicious of our intentions, so when they started to stand up we stopped approaching. Unfortunately, my Blackberry doesn't exactly have a zoom lens, so this is the best I could do. In other news, Boogie had a fabulous walk this morning, and he even felt energetic enough to actually run, as apposed to his usual rambling trot. It always makes me feel good when he has a really good, strong day.